Looking to make bacon for the first time. I've seen pork belly at costco. Does anyone have any experience using it for this? I have a Costco belly going right now. I am following the recipe from the Kamado Joe video. Mine should be ready to smoke next Monday. Ok cool! Let me know how it turns out. I may get some this weekend. Yes I've done then several times. I've used both a dry cure method and a wet cure method. I started with small amounts, and now do several whole bellies at a time. 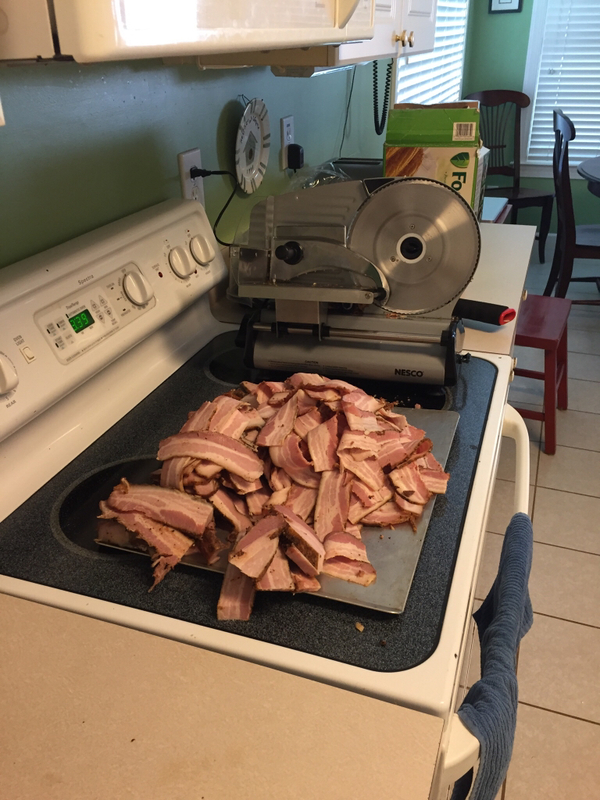 I use Meathead's bacon recipe. It's always a hit. I usually get some of the neighbors involved. They have to take care of the bacon during the curing process, then we get together to smoke it and have a few beverages. I guarantee you'll never have any complaints about smoke if you do this. I prefer to make Canadian bacon from pork loins. Much less fat. This was a Costco belly bacon. Next time I might go a different route than using honey - not because of flavor which is good but because the honey tends to want to burn when cooking the bacon. Oh wow, that looks great. Mine should be done curing tomorrow or Wednesday! Completed mine last night. I have it sitting in the fridge for slicing today. On a side note... My son went at it while I was running a quick errand. Judging from the chunk missing, he liked it very much! This was a Costco belly, 8.8lbs. I let it brine for 8 days, sit in the fridge over night to dry on the 9th, and smoked it the 10th day. The one difference I saw in my smoking and the KJ video, the video version looked dryer. When I pulled mine off the grill, it had puddles of fat on top, and was very wet. I was talking to some buddies of mine about this, and they liked the idea and we are going to try it. Do you stack up the bellies on separate racks,or maybe use a rib rack to fit multiple bellies on there? Curious of the logistics? 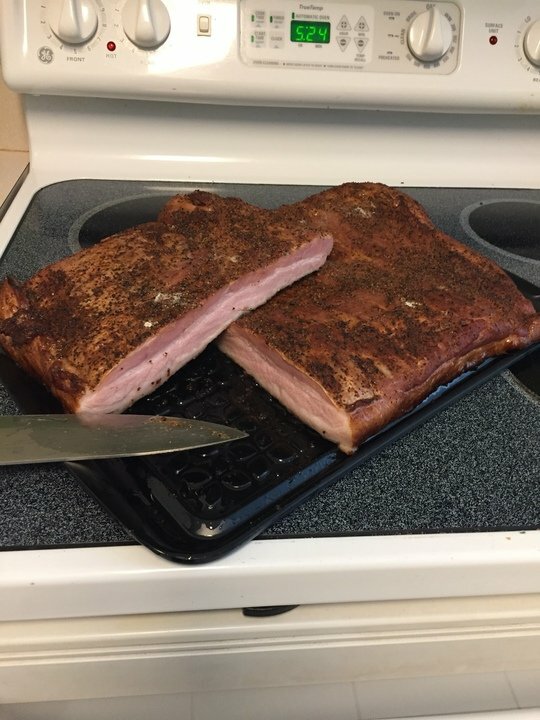 My bacon turned out great too! It wasn't as salted as I'd like but nothing a little tweaking can't fix. I wish I had a meat slicer though, it's a pain to slice. That Nesco I have there, it was only $79.99. I was really surprised how cheap a decent slicer was. Sorry cwhuling, I missed this question. I cut the bellies into chunks that fit into large ziploc freezer bags for the brining stage, so at smoke time, I can usually get 4-5 of them on the grill at a time with the upper rack in. I just smoke in shifts. It's a fairly short cook to get them up to temp, so it's easy.